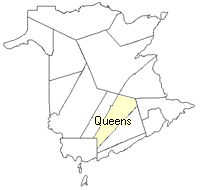 Located 2.26 km SE of Belyeas Cove, on the road to Henderson Settlement: Wickham Parish, Queens County: also called Shanahan Settlement for John Shanahan, a settler from Northern Ireland about 1829: renamed Shannon when the post office opened: PO 1877-1969: in 1898 Shannon was a farming settlement with 1 post office, 1 store, 1 church and a population of 100. New Brunswick cadastral maps show the basic features of the province along with the boundaries, lot number, and grantee’s name for land granted by the province. These maps are cumulative, showing all grants regardless of date. or download the full size version. * Distances and bearings were calculated by using the latitude and longitude of the community.